Frederic Halford has the privilege of being one of the most misunderstood figures in the history of fly fishing. Having read at least one article which credits him as being the inventor of the dry fly, it is a relief to know that at long last a biography of this great man is available, and one which puts right some of the misconceptions which have grown up around Halford over the last century. Halford, as several of his contemporaries pointed out, was not an easy man to get to know. Intensely reserved and methodical to the point of obsession, he was strangely ill-suited to becoming the high priest of the chalk streams; yet he became the unwitting founder of a school of angling whose echoes reach down to the present day. Although there aren’t any particular insights into the nature of the man, and given that much of the material is already available in Halford’s compendious autobiography, Tony Hayter has done as good a job reworking the information and he dissects the great man’s life and relationships as clearly as anyone could hope, inserting a good deal of background text about Halford's life and times. 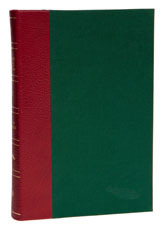 The illustration shows the limited edition, which was presented in a slip case and has become collectible, but there was also a trade edition - both have suffered the fate of all monographs on great anglers and have gone out of print. This is a shame, but it reflects the limited market that exists for specialised works like this, however good they may be - there simply isn't the demand for them. Publishing this book was a brave venture for which Hale deserve to be congratulated, because Hayter's work definitely falls into the category of books that 'ought to be published' even if by definition they are fated not to be commercially rewarding. Perhaps one day the angling public will wake up to what they are missing, but in the meantime, long live Hale's traditional publishing values - and Tony's, for putting in so much effort. The limited edition, shown in the illustration, has become collectible, but the trade edition is available second hand from the usual sources - do your homework before you buy, because some unsold copies from the original print run still appear to be available from Coch-y-bonddu Books.